September is over as quickly as it began, and I thought it would be fun to do something I’ve never done before and give you guys a quick roundup of the Top 5 Best-Sellers from my blog this month! It’s a great time to feel happy with your great purchases if you purchased one of these items or take another peek at everyone’s faves! You guys were loving all the cardigans and accessories this month, and I think you made some great choices. Obviously, I LOVE every one of these, and it makes me so happy to get to see what you guys love too! :) Thank you to each one of you for supporting me and purchasing through my links!! 5. Round Sunglasses (shop here): I adore these sunnies and can’t believe they are only $14! They’re the perfect size for every face shape and come in 3 other color options as well. Mine are the “brown tort” for reference! 4. 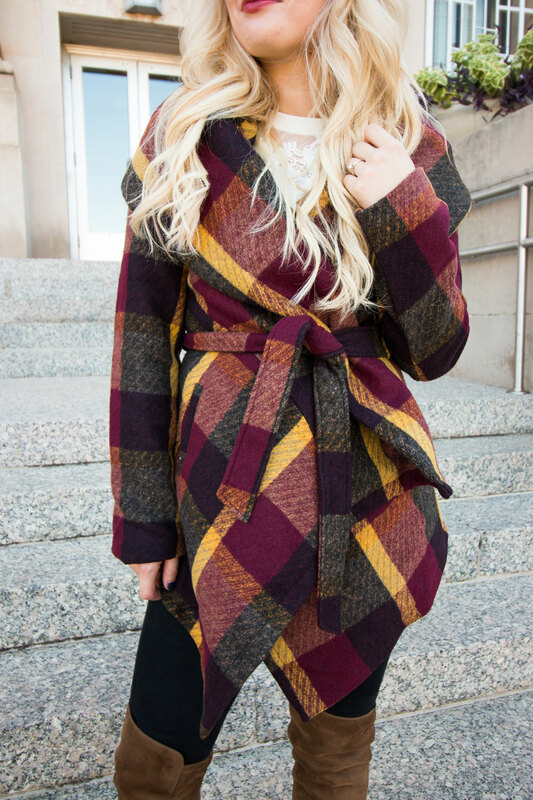 Plaid Coat (shop here): The color palette on this coat is just pure perfection for fall! The fit is so cute and unique (fits TTS), and I can see why you loved it as much as I do! This one also comes in several other color combos and solids that are equally as adorable! 3. Striped Cardigan (shop here): One of my favorite purchases of the month as well, and I’ve already worn it several times since I got it in! It’s still on sale for 40% off with code COZY40 and is super great quality for the price! This retailer does move a little slower with shipping than average so you may want to pay for express shipping if you need it ASAP! 2. Camel Cardigan (shop here): This one (also 40% off right now!) and the BP camel cardigan I have were actually tied for 2nd place! I don’t know that I can pick a favorite between the 2 either. I love this one because it’s a little thicker and dressier, but the other one is such a great basic + is a really flattering fit. So, take your pick between either because you can’t go wrong with this fall staple! Gucci Belt Dupe (shop here): Far and away my most clicked on AND most sold item of the month! And I have heard from sooo many of you that you love love love it! It’s such a good one, guys. It looks so similar to the real one to me and is the perfect touch to basically any outfit! I’ve got wayyy more than my $30 money’s worth of wear out of it. If you don’t have one yet, GO GO GO order this one now! I ordered the 110cm one and am usually size 2-4 in jeans for reference.